17 Great Graphic Novels from 2017! As another year comes to a close, I'm looking back on one of my favorite hobbies: reading comic books! Whether they were new stand-alone stories, retro reissue collections, original children's series, or new adventures with familiar faces, there was no shortage of comic-related reading material in 2017. While not necessarily a "Top 10" (especially since I selected seventeen!) and definitely not in any order of importance, the following are just 17 really cool, fun, entertaining, and thought-provoking graphic novels I read and enjoyed in 2017—all available to check out from the Free Library's collections, in either physical book or digital formats. As I recommended a few weeks ago on our Read A New Book Month blog post, this was my fav graphic novel that I discovered this year. Astounding artwork propelled by frightening and fantastic fiction mixed with riveting reality. Be on the lookout for Volume 2 in 2018! This serves as a prequel to the current ongoing Black Panther series being helmed by Ta-Nehisi Coates. Black Panther takes a backseat as this collection delves more into Wakanda’s lore with the Dora Milaje, an elite task force trained to protect the crown of Wakanda at all costs. At the core of the story is a rebellious romance between the Midnight Angels, Ayo and Aneka. Another must read in the Black Panther cannon before the movie debuts in February 2018! I dedicated a whole blog post earlier in the year to this landmark collection, a 162-page graphic novel from IDW Publishing and DC Comics, honoring the victims, supporting the survivors, and celebrating the LGBTQ community affected by the senseless Pulse Nightclub tragedy in Orlando, Florida in June 2016. An important and inspiring read. I highlighted Tom Gauld's Mooncop in my year-end best-of graphic novels list from last year, and thankfully there is a new collection to praise again this year. This best-of collection of his simple, sarcastic, and silly weekly strips in The Guardian is a much-needed laugh amongst these unfunny times. Similar to Tom Gauld's style—both artistically and content-wise—Sarah Andersen's anxiety-ridden, sarcastic scribbles on life, love, and lunacy are laugh out loud funny. Skip Netflix—read this book and chill! Cats + Astronauts = CatStronauts! Commander Major Meowser, brave-but-hungry pilot Waffles, genius technician and inventor Blanket, and quick thinking science officer Pom Pom have in the span of one publishing year already flown to the moon to turn it into a solar power plant for the Earth's energy crisis; were the first cats to travel to and colonize Mars; and repaired the Hubba Bubba Telescope on the International Space Station! Definitely my vote for best new all-ages comic series of the year! The classic heroic line work of acclaimed artist John Byrne is on full display in this massive collection. Superman, Wonder Woman, Batman, The Flash, Green Lantern, Teen Titans, Hawkman, Shazam, and many more are all here, in both full stories and selected cover art. A black-and-white dystopian adventure and coming-of-age love story with a nod to Orwell's 1984. Instead of Doublespeak, the Guarantee Committee makes sure everyone speaks in hyper-kinetic and utilitarian statements. Angela finds herself recruited into a resistance movement where the key to rebellion is taking things slow and to unplug from this rapid-fire culture. A truly unique take on both storytelling and artwork, with a payoff worth the slowburn. Science, magic, mystery, and adventure are the main ingredients in the genre-blending tale of Boone Dias, an interdimensional explorer and scientist from Earth who stumbles into the magical (and dangerous) world of Ether. Matt Kindt creates another fantastical universe, embelished in vivid color by David Rubin's out-there illustrations. One of this year's best! There's never any shortage of Star Wars-related reading material now every year, but this limited series stands on its own as a spy adventure that just happens to feature The Rebellion's star scoundrel, Han Solo! Can our fav space cowboy win the Dragon Void race and find the traitor within the Rebellion before it's too late? Turn the page, hop in that "bucket of bolts" (Millennium Flacon, natch! ), and blast off into hyperspace! Elfen sword-wielding Link jumps off the video screen and into the pages of this Manga series (and it's legit, so you'll be reading from right to left in each volume), which is loosely based on the Twilight Princess video game from Nintendo. The artwork is detailed and the action is dangerous, as Link ventures into the Twilight Realm to save Hyrule by finding the fragments of the Shadow Crystal before the Shadow King does and plunges the world into darkness. The 3rd (and concluding?) volume will be released in 2018. Hail to the King! Jack Kirby's '70s output at DC was weird and wild, and Mister Miracle is no better example of the fantastic four-color worlds he created during this time. Witness Scott Free, a New God offspring, hiding out on Earth from Darkseid’s sinister agents and reinventing himself as the unstoppable escape artist, Mister Miracle! Every panel is an explosion of action, whether the characters are actually battling throughout the universe or just talking and drinking a cup of joe. My vote for Best Reprint Collection of the Year! This cautionary tale filled with southern blues and murderous machinations is more cinematic than comic, even Cohen Brothers-esque in its plotting and pacing. To get the truly immersive experience, tune in to and crank up the accompanying soundtrack by Dan Auerbach (Black Keys) and Robert Finley while reading. A biographical comic about the driving force and creative brain behind the gaming and pop culture phenomonon that would become Dungeons and Dragons. Have you ever actually read the Terms and Conditions when you sign up for an online service or download a new version of software? Nope, me neither. Luckily for us that R. Sikoryak's adapted Apple's iTunes Terms and Conditions—word for word—using imagery nicked from every corner of comics history, with Steve Jobs inhabiting the avatars of characters like Wolverine, Homer Simpson, Spongebob Squarepants, Archie, and others. Hilarious and surreal, you'll never look at legal mumbo jumbo the same way again! Since we last saw Mimi Pond in 2014's Over Easy, she's still trying to make it as an artist in '70s San Fran and grinding out a living as a waitress in a drama-filled diner named the Imperial Café. The hippies, punks, weirdos, druggies, drunks, and dreamers that drift into and out of her life are the real stars of this autobiographical adventure through Pond's starving artist years. Another outstanding edition to the Graphic Novel Memoirs genre! Translated into English for the first time and released in conjunction with the Luc Besson summer blockbuster film adaptation, Valerian is the sci-fi space opera comic book that you've never read but have seen in other forms of media for years (cough—Star Wars—cough). The artwork alone really does transport you to another dimension, let alone the ahead-of-its-time dialogue and storytelling. Highly recommended! 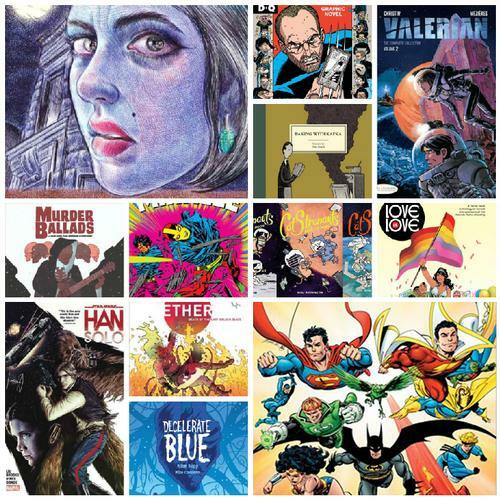 Search our catalog for these titles and to find more great graphic novels from superheroes and comic strips to autobiographical and manga titles as well. Tell us in the comments what were some of your favorite comic books and graphic novels that you read in 2017! Know of a great graphic novel or comics collection we need to acquire? Let us know! Here's to more Biff! Bam! Pow! in 2018! Whether they were new stand-alone stories, retro reissue collections, original children's series, or new adventures with familiar faces, there was no shortage of comic-related reading material in 2017. Here's to more Bif! Bam! Pow! in 2018! Add a Comment to 17 Great Graphic Novels from 2017!